Dave Buznik: Five hour drive to find out mommy had a jelly bean removed from her nose... Glad I missed work. Can we eat now? Published by Silverbird Songs Ltd. Administered in the U.S. and Canada by Almo Music Corp. and EMI Blackwood Music Inc.
Dr. Rydell is a therapist with a tendency for the unusual. As the therapy progresses things seem to get worse and after another huge slice of misfortune, Dr. Rydell is forced to move in with Dave and conduct 30 days of intensive Anger Management. 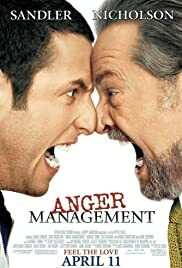 With good comic performances from Sandler and especially Nicholson and some hilarious interaction from the support cast 'Anger Management' is certainly not short of laughs; but it does seem to get a little muddled along the way. 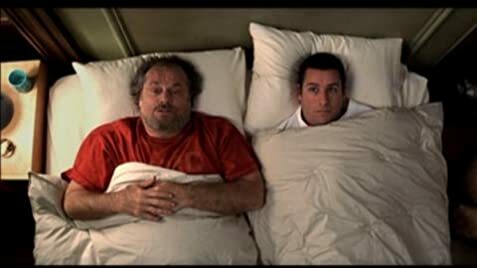 That said the movie finishes well (although totally unbelievable) and ends up as a comedy film you'd be silly to miss out on. 49 of 75 people found this review helpful. Was this review helpful to you?